I'm sorry I haven't made a post for so long. There were three things that got in the way. We had the photo shoot earlier in the month and I barely got my garments done. Two days after the photo shoot was TNNA which was in Washington, DC this year. I lived in DC for 12 years so it was great to go back. In addition to the show, we visited three yarn stores, Second Story Knits in Bethesda (it was the Needlework Attic when I lived there), Loops in Dupont Circle, and Fibre Space in Alexandria. All were wonderful. I brought home some souvenirs, naturally. Since I've been back I have done NOTHING but get ready for the conference. We will have 34 different yarns at the tasting. Only 7 more to go! I have a new student from France. I generally send the swatches back after I have reviewed each lesson. She wants me to hang onto them and send them back all at once. We will give this a try. I'll photograph them with the letter. I don't plan on doing this for US students but for international, it worth a try. International postage rates are obscene. This entry is due to a suggestion from a reader. She was confused as to where to pick up stitches along a horizontal edge when the stitch pattern is not stockinette. I discussed this principle when I did an entry on seaming horizontal edges. You seam and pick up stitches at the same location, in the center of the stitch immediately below the bind off edge. 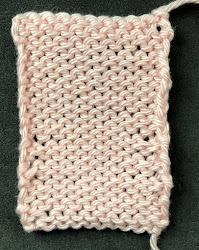 For knit stitches, this is in the center of the "V" and for purl stitches it is below the "frown". Remember the "smile" is the space between the stitches. This rule applies to all stitch patterns I can think of. (If you don't know what I mean by "V" or "frown" and "smile" check the index for my blog under stitch anatomy. It is impossible to finish garments properly if you don't understand stitch anatomy. This photo shows stitches picked up in seed stitch. Garter stitch is the same on both sides. If you look at the bind off edge, on one side you will see the chains of the bind off. On the other side, it just looks like a purl stitch edge. It does make a difference depending on which side you select. In the photograph below the stitches were pick up on the side with the visible chain. Notice that the new stitches are on top of the ridge. This photograph shows where the stitches were picked up on the other side. Notice that there are several rows of knit stitches. When you pick up the stitches make sure that you are consistent when selecting what side to use. Salon will be on Sunday (June 26) from 1:30-3:20. I have not knit for a week. I'm winding yarn balls. Here are two photos from the photo shoot.